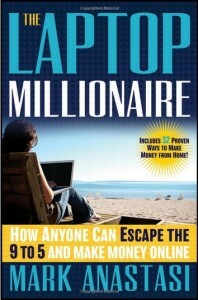 Mark Anastasi’s The Laptop Millionaire: How Anyone Can Escape the 9 to 5 and Make Money Online scores both hits and misses—and, on each page, offers valuable information to budding laptop entrepreneurs. In this review I will cover Anastasi’s basic points, and tell you why, even though there are a few problems, this book is still worth reading. Sometimes the hardest part of making money online is figuring out where to start. In The Laptop Millionaire: How Anyone Can Escape the 9 to 5 and Make Money Online, Mark Anastasi answers questions that many aspiring laptop millionaires don’t even know to ask. Anastasi sets out step-by-step strategies, but you can also pick and choose areas that interest you, and go your own way. Each chapter targets a different category, with ideas not only on how to get started in a given activity, but how to maximize your time, and results. Take each chapter as a stand-alone topic, or as part of an overall strategy, following each step as it is set out. One of the most frequent complaints about Mark Anastasi’s The Laptop Millionaire: How Anyone Can Escape the 9 to 5 and Make Money Online are that parts of it resemble an infomercial. There are links within the ebook text leading to Anastasi’s web site, as well as offers to attend his webinars, among other things. Even here, though, there are lessons to be learned regarding the self-promotion part of becoming a successful webpreneur. Keep that in the front of your mind while reading this book, and ask yourself—what works with Anastasi’s approach? What doesn’t work? Is there a way you could do better at both providing relevant, valuable information, while also guiding people to your site or whatever else you are offering? If so, perhaps—right there—you have the genesis of your own successful ebook or webinar series. Don’t let opportunity pass you by. Can Anyone Escape the 9 to 5 and Make Money Online? The question many readers and viewers want answered by book reviews of works like this is… is it true? Does it work? Can anyone really follow in these footsteps and make millions simply by working online? My answer: yes. It takes more than a book, though. Or even an instruction template. It takes dedication, attention to detail, willingness to work, willingness to try new things—and a belief in yourself. Use The Laptop Millionaire: How Anyone Can Escape the 9 to 5 and Make Money Online and the options it offers as a way to find your feet, and maybe your passion, and create your own roadmap to financial freedom. If you have any questions leave them in the below comments or contact me at my Wealthy Affiliate profile.